This Beijing-held September mega-event will see a presentation of new labelling technology and complete solutions for the closures market and beverage industry Labelling, filling andstretch-blowing plus cap production, control and handling: Sacmi offers the beverage market not just individual machines but also complete, fully integrated solutions spanning from raw materials to finished products. Such “turnkey solutions” will be showcased at China Brew & Beverage 2012; this two-yearlyevent, dedicated to technology and equipment for beverages and liquid foods, will take place from 19th to 22nd September at the China International Exhibition Center in Beijing. The Sacmi Group will be at stand 1C005, covering 182 m2, inside the International Area (Hall E1). A great deal of attention will, of course, be focussed on the outstanding cap-making technology: CCM (continuous compression moulding) is currently the world’s most competitive solution for the production of mineral water caps, hot and aseptic filling. Designed by the Sacmi Imola Closures Division, this series includes the top-of-the-range CCM 48SB, which will be on show at the fair. Capable of producing up to 1600 caps per minute with just 48 cavities, the press will be equipped with a mould suitable for the production of three types of S29W caps in HDPE with diameters from 29 mm and weighing just 1.25 grams. Its winning feature? The ratio between high output rates and consumption. Thanks to “lean technology”, in fact, Sacmi has achieved further improvement of energy performance, while keeping cap production cycle times below 2 seconds. A great opportunity, then, for the Closures Divisionto show off the advantages of compression technology: ultra-low cycle times, low consumption and low maintenance costs. 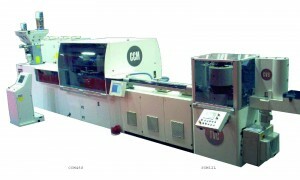 Extremely compact, this press will be displayed together with the CVS3000vision system for in-line cap control; the latter has been developed by the Automation and Inspection Division, which will also be showcasing the innovativePVS-2, an in-line or off-line sampling system equipped with cameras for complete, precision control of preforms, both inside and out. The Labelling Division has chosen the Chinese market to present the latest innovations including the new FORMSLEEVE+, to be applied to the Sacmi labelling machine range, which visitors can find out about and see working at the Group’s stand. The stand will also be dedicating plenty of space to the SBF range of rotary blow moulders, which feature from 6 to 24 stretch blowing stations. These are machines at the very apex of their category, ensuring output rates of over 64,000 bottles per hour in the standard half-litre format. Advantages on this line include the 1B=2b system, that is, the possibility of installing, on every machine in the range, a one-cavity mould for large bottles (up to 3 litres) or a 2-cavity mould for small bottles (up to 0.6 litres);moreover, the switch from one size to another is extremely simple and is completed very quickly. Hourly output may therefore be as high as 2700 small bottles per station, thus making full use of the output capacity and potential of both the machine and any connected downstream filling line. The fair also provides an opportunity to find out about the PET preform injection production systems, thanks to the innovative IPS press: in addition to the flexibility of the system and the rapidity of size changeover, outstanding ergonomics, excellent energy saving performance and compactness, this latest offering from Sacmi can also count on the global sales and after-sales service network. Sacmi-developed filling technology will also be playing a prominent role, being extensively represented by a complete range of mechanical or electronic isobaric and volumetric fillers for ambient temperature or hot still product filling and sparkling product filling. SACMI’s strength in the Beverage sector also stems from its skill and experience in supplying turnkey lines, which combine stretch-blowing, filling and capping to provide a winning combination of low investment outlay, minimum overall dimensions and excellent process efficiency: solutions developed to meet every specific customer need.